Anyone who has been even tangentially involved with the beer community and scene throughout Maine and in Portland over the past decade or so, would very likely to happen to know Seth Vigue. Or, at the very least, y’all should. Seth Vigue, affectionately better known to some as Viggy 3 Flip (or simply “Viggy” or “Viggs”), first cut his teeth in the industry behind the bar at the “hallowed” Barnacle Billy’s in Ogunquit, you may well know him from his years there. Or, perhaps you met him at the beloved Thai Smile in Farmington, Maine as he poured you a beer—after all, that’s where Noah first met and befriended Seth when Noah was living in Western Maine, attending school. Maybe you know Seth from his time at Bissell Brothers in Portland, literally here from day one, the first employee. Doing anything and everything to help our brewery succeed. He’s also an incredibly skilled homebrewer. Starting in on the hobby in 2015, notably after he was already a professional brewer with us at Bissell Brothers, Seth brewed a number of different beers and styles—motivated by curiosity and initiative and a self-directed drive to learn more about beer and be a better brewer. In Seth’s mind, a Cream Ale just “sounded good,” the style intrigued him. And his version of that beer is the one homebrew that truly became his, a beer he befittingly named Kickflip for the skateboard trick, one of Viggs’ favorites. If you think about it, the Cream Ale beer style personifies Seth in many ways. It’s modest and humble. It’s hard-working and reliable. It’s friendly and approachable. Balanced and poised? You bet. After a hard day, you look in the fridge and there in the corner are a few cans of Cream Ale, seemingly always there, dependable. When things are going to hell at the brewery, yep, Viggy is there for you to lend a helping hand. At the end of the day, Cream Ales are just plain awesome. Clean and crisp, they are simply fun and easy beers to enjoy. But first off, there is no “cream” in a Cream Ale, there’s no lactose, no nonsense. Instead, a traditional Cream Ale is a light bodied ale, typically brewed with corn and/or rice, low in esters, and balanced—neither the hops nor the malt should prevail. Sessionable strength ABV. Absolutely drinkable and delicious, a beer-flavored beer. With his recipe, Viggy sought out to brew a traditional Cream Ale. Inspired deeply by Frank Lever, the owner of now-defunct Kennebec Brewing in Gardiner, Maine, Seth hoped to recreate something in the vein of the “iconic” Kennebec Cream Ale. A Cream Ale brewed in the true spirit of the state of Maine. The grist on Kickflip is simple. 2-Row Barley Malt, almost entirely Maine-grown Buck Farms Mapleton Pale 2-Row, serves as the base for the beer, and there are equal parts Flaked Corn and Flaked Rice added. These flaked adjuncts lend a defining zippy smoothness and crispness to the beer, drying it out, creating drinkability. The hop profile is, fittingly, simple as well. A light addition of Cluster hops, one of the oldest, most classic American hops, is utilized in the kettle and whirlpool. Hallertau CalLista, a low-alpha, highly aromatic hop, serves as the dry-hop. It’s an incredibly balanced beer, an homage to Kennebec Cream. 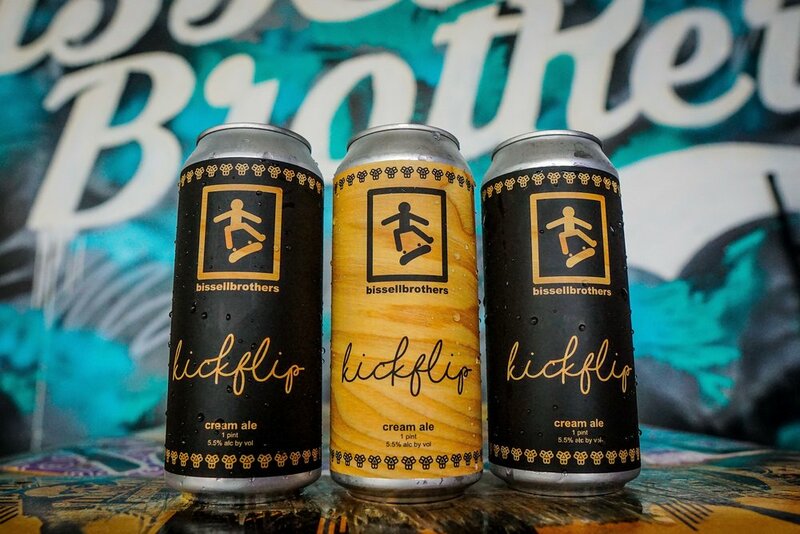 Kickflip is truly a Cream Ale brewed in the spirit of Maine, with Maine-grown ingredients at that. And although ironically the Cream Ale was developed in the 1950’s and 60’s as a quick fermenting Ale, a beer that could be turned around faster than a Lager, but could “compete” with macro Lagers having similar flavors, Seth’s goal was the opposite. We aren’t trying to “compete” with any gas station macros, and to be honest, sometimes we even love those beers for what they are. We wanted something complexly more nuanced in flavor, with similar drinkability. To that end, we fermented Kickflip for a full two weeks in a conical fermenter at low temperatures, and then condition the beer cold in a horizontal tank for nearly an entire month. The beer is naturally carbonated on the higher end for an Ale. So, the result is a heady, and you guessed it, a creamy, delicious treat of a beer. We hope you enjoy the fruits of Seth’s—and the rest of the production and packaging crew’s—labors as much as we do.